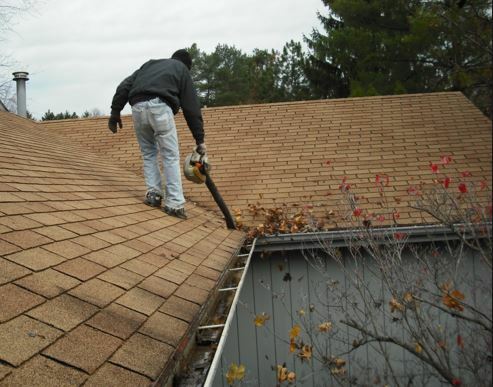 Gutter maintenance in Hamilton, Ohio is extremely important. Your gutters are a primary source of protection for your home against water damage. When your gutters become blocked or damaged, you are putting your home at risk for roof damage as well as structural damage to your home due to water leakage or flooding. One way to protect your Hamilton, OH home is to make sure you keep your gutter system is properly maintained. Regular maintenance involves several aspects to gutter upkeep. Over time, dirt, debris and leaves can collect in your gutters and block the flow of water. When gutters back up, your home is at risk of water damage. Gutter maintenance starts with regular inspections of your entire gutter system to check for any damages or breaks in the system that need to be repaired or replaced. Inspect for blockages or standing water in gutters. Inspect for cracks or damage to any part of the gutter system that may need repair as well as that the system is connected properly to the roof board all around the home with no loose, or sagging areas. The grade of the gutters around the house should also be inspected. Improper installation can mean water slowing or stopping in the gutters despite no obvious signs of blockage. Downspouts are responsible for leading the water down and away from your home. Check your downspouts to be sure there aren’t any separations or breaks. The end of the spouts should be aimed away from the foundation of the home. The grade of the ground at the end of the spouts should be significant enough to keep water flowing away from the home to prevent back flow or pooling. When downspouts don't properly direct water away from the home, water can saturate the ground near the foundation of your home which can lead to major problems. The most common water issues include:pest infestations, mold growth and flooding. Basements and roofs are the most common areas of a home to sustain water damage due to poorly maintained or improperly installed gutter systems. Gutter system maintenance can be done by using a DIY manual or by hiring a professional gutter repair and maintenance professional. A professional technician will inspect your entire gutter system and give you a quote on gutter leak repair, gutter cleanings, even installation of a new gutter system. Roof gutter maintenance can be difficult for many homeowners, especially when repairs are necessary. Let the professionals at Hamilton Gutter Pros take care of all your gutter needs so that you know the job was done right the first time. When you keep your gutters well maintained, you not only help ensure the integrity of your home, but you can help prevent costly repairs and problems in the future. Hamilton Gutter Pros are trained to take care of all your roof gutter maintenance and repair issues on any home or business. From sheer flow gutter installation and full gutter replacement, to generalized cleaning and maintenance issues, you'll be sure your gutter system is fully intact and operating at its optimum to protect your roof and home from water damage.